For those reading this who have fished Lake Pontchartrain during this century will agree completely that fishing the Lake for speckled trout has completely changed and not for the better. What some may disagree on is the reasons why and that is ok as there is not a guaranteed science behind it but we all have our educated theories and ideas as of why. If you are one who just started fishing speckled trout in Lake Pontchartrain the last five years and feel the trout fishing is good now, well you would have been in heaven 20 years ago. So why has the Lake changed, why is it so hard to catch quality speckled trout consistently? In my opinion the number one direct reason is the lack of salty water. Salty water during the months of April through October is essential to habitat quality trout during there annual spawn. Trout need quality salt water to float their eggs for reproduction and Lake Pontchartrain simply can not consistently hold the correct amounts of salt during these months. So what caused the lake to start loosing salt you may ask? Well there are many variables that can cause this and typical Mother Nature will be different from year to year and can change ecosystems drastically as we have zero control over that but things that are man made can be controlled but they too can change an ecosystem as easy as Mother Nature can. In my opinion the leading cause of change in Pontchartrain is with out a doubt the little rock damn that crosses the MRGO. The damn was put their immediately after hurricane Katrina as a desperate attempt to slow down tidal surge. This damn as we all know is located near Hopedale and Shell Beach and has stopped the flow of pure salty Breton Sound water from entering the southern part of Lake Borgne and the Industrial Canal that flows into Lake Pontchartrain near the SeaBrook Bridge. So much has been lost that fed our estuary do to this damn, not only has it caused the entire estuaries’ salt levels to drop drastically, the amount of bait fish, shrimp, and migratory fish that came through this five lane interstate is now gone. Well some may say “How can that be, we still have the Chef and Rigolets Pass” well that is true, but what good is the Chef going to be when most of the salty waters it provided is now gone due to the back end of Lake Borgne becoming so fresh now because of the damning of the MRGO. And yes the Rigolets is a huge pass that brings in tons of water from the Mississippi sound and essential to the Lake Pontchartrain’s habitat, but what good is it to the Lake when the Pearl River, which is located at the mouth of the Rigolets, is at record highs pumping pure freshwater right into the Rigolets just like it has done the last five years. The Lake used to be able to handle rainy and flooded years due to the MRGO counteracting the abundance of freshwater coming through the Rigolets by providing the pure salty water that used to pumped through the Chef and the Industrial canal. The Lake is still a great place and we still make some great catches but consistently catching big trout year round and especially in the warmer months has dropped drastically and we may never see those days again. Catching quality trout in the Pontchartrain basin during the summer is a thing of the past but the fall and winter fishing seems to still be productive and that’s when the area’s regular trout anglers target the lake now of days. But wouldn’t it be nice to still be able to target big trout year round, or still have a chance to maybe win a boat out of the Pontchartrain basin in CCA Star tournament like we used to. You can look back at the records of the Star rodeo and see how often the Pontchartrain Basin would produce one of the summers top trout. Now due to these things mentioned above it has not happened in six years ever since Dr. Bob Weiss won his boat with an 8.02 that I personally weighed which he landed on the northern point where the Rigolets meets Lake Pontchartrain. Just during the June of that year there were at least 30 trout caught off that exact spot that were over five pounds. In the last five years I can not recall one single trout caught in our estuary during the summer months of that size. So what do we do during the summer now? Well we still seem to catch a few trout on the Lake Borgne rigs or places like the CSX train bridge, but limits are almost non existent and if you catch a three pounder you may want to consider calling a taxidermist and put it over the fire place. The days of catching fifty trout on June’s full moon and thirty pound five fish stringers seem to be old fish stories and memories right now. I am grateful I was able to witness the days of the past but I would sure like to see them again one day. During the summer months now I almost exclusively target redfish and bass as the trout are simply too inconsistent and small. 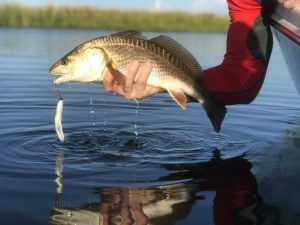 It’s simply not worth getting up at 4:30am to catch ten twelve inch trout to me so I like to sleep in till about six and target redfish in the marsh and patiently wait for the fall and winter specks to come back into the lake as they do not need the salty waters during the colder months simply because they are not spawning. Now several of you reading this may disagree with these theories of why or how. And may say if the damn wasn’t there we would still see the lack of summer time trout and maybe that is true and I would gladly listen to other thoughts or beliefs, but one thing that we all must agree on is the FACT that the Lake Pontchartrain basin during the summer months is depleted and a thing of the past for catching quality trout. The big question is, will the damn in the MRGO actually help at all if we get another major hurricane making a direct hit on us? My answer is ABSOLUTELY NOT!!!! Make sure read all of our articles at MatrixShad.com and check out and subscribe to all of our DockSideTV videos on YouTube!! !